Camaro, GTR, Supra and any other sporty coupe would all suffer the same fate under the current control chassis. The roadgoing Camaro's dimensions are actually BIGGER than the Supercars specifications. The Camaro would in all likelihood retain it's dimensions very well when scaled down to fit the Supercars chassis. Probably still wouldn't work PERFECTLY, but a lot better than the Mustang. That was my first thought. They can the Mustang, yet bang on about how Toyota could be tempted with a very low roofed Supra. So the Supra road car is 40mm shorter, 62mm narrower, and not as high by 100mm than the Mustang. There is potential for a Supracar to look entirely ridiculous in every aspect aside from a render. 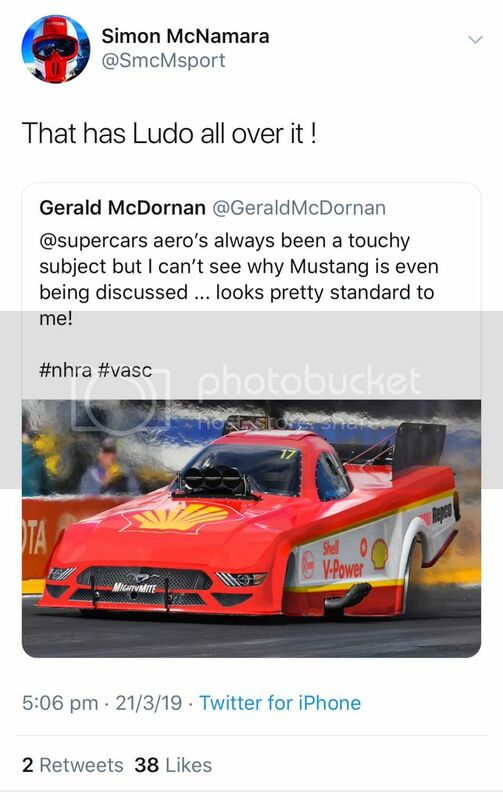 So the Mustang has likely been raised by 100mm, squashed in width by 50mm, and stretched in wheelbase by about 100mm potentially (depending on what the wheelbase of a COTF is). No wonder it looks so strange!! According to the Google machine a 6th gen Camaro is 1350mm high. 50mm lower than the Mustang. Would that not mean its roofline will suffer the same fate, only 50mm worse? Remember the car Homer designed on the Simpsons? What is the wheelbase of a COTF? Isn't it the same as a BF Falcon? A carryover legacy when the VE was released and had to match the BF's wheelbase under the Blueprint rules. The FG then had to be chopped to match the chopped VE, upon its release. Considering this means that the roofline will be lowered less than the Mustang's, I don't see how that would make things worse or better. You'll notice that in most measurements, the Camaro is either larger than the Supercar or much closer than the Mustang was. Relative to the Mustang, the crucial detail is width, where the Camaro is narrower - it would be slimmed down by almost half the amount of the Mustang, which would have a major effect on how tall it looks. Now, there IS a problem when comparing height here: These sorts of measurements are usually measured from the roof to the GROUND, and a Supercar obviously sits lower than a roadgoing Camaro and Mustang. What we really need is a reliable measurement from the roof to the bottom of the bodywork. Thank you so much for your research! ......What we really need is a reliable measurement from the roof to the bottom of the bodywork. By eye the distance from the bottom of the sill panel and the highest part of the roof (in the centre line) is about 1220 at the highest point towards the front screen, 1150 where the back window starts, which is where the main problem in fitting the cage is. The roof curves to the outer edges there a bit too (1100). Having seen the car at the Phillip Island test (albeit from a distance), I think most will think the car looks better in the flesh and will not notice the differences that much. The camouflage livery hiding the body lines does not help. I remember the outcry when the first leaked photos of the production 2018 Mustang surfaced. The car looked pretty plain and very ordinary, but it turned out to be just an unfortunate capture from a poor quality video. I think in a few months time most of this fuss will similarly die down. I have no doubt it will look a lot better once those ungodly huge rear wing endplates are replaced with the proper ones. It's amazing just how much of the look can be influenced by such things - look at a DTM car from the side, then photoshop out the rear wing - The top of the car will suddenly look like it dropped 4-5 inches. That really high wing skews the look at the bodywork lines, and I'm sure that's a big part of what's at work here. I wouldn't put blind faith in that source, but until someone can dig up something more trustworthy it's the best we've got. Could it be because it is a reskin of an existing Falcon? Mustang my ****,thats just a Falcon with a pony on the grill. Relative to the body's B-pillar, the standardised driver's seat position is further forward, while the coupe's roof is more rounded front-to-back than any of the existing models. That front end actually looks more like the road car than the Supercar.